A grow light used for indoor plants, vegetables and flowers. ViparSpectra is a newly launched grow light which is scientifically engineered to keep balance of PAR/Lumen Output and Coverage. The LED provides the plants with everything they require. We will be reviewing this product in this post for you. While reviewing a product we need to go through the products specifications. For example, light (watts). Watts of light can be used to measure the power consumption by the product. There are many other products available in the market that can provide you with the same function but by reviewing the product we will help you in finding the best one among all. Here is list of some of the pros and cons of the ViparSpectra 1200w LED. The best thing about ViparSpectra 1200W LED is full spectrum. This is the major advantage of ViparSpectra 1200W LED over other similar products. By full spectrum we mean full range. It provides the plant with full spectrum of light so that the light reaches at every part of the plant. So, no matter where plant is in its growth stage they will get appropriate light to flourish. 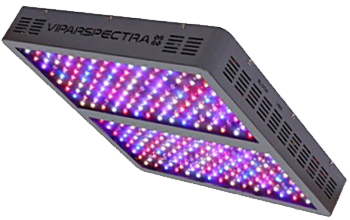 Some of the other products do provide good spectrum and intensity of light but they direct the light towards the center of the plant.ViparSpectra 1200W LED makes sure that light is evenly distributed in all parts of the plants. Here is a list of Best Full Spectrum Grow Lights. The first few things you notice while purchasing a product is its warranty and what type of warranty does it comes with. ViparSpectra 1200W LED provides competitive coverage. The product has beaten other products in the aspect that it comes with the 3-year warranty. This is a serious time period and if your product is working even after this time period then it definitely worth your money. This 3-year warranty is also followed by a 30-day satisfaction guarantee. An electronic product is always reviewed on the basis of how much electrical energy does it consumes. The ViparSpectra is rated as 1200W electronic product but this doesn’t mean that it consumes this much energy. 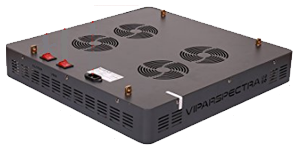 The ViparSpectra consumes 524W according to the manufacturer which is way less than 1200W but it is also capable of producing 1200W according to your requirements. So, ViparSpectra 1200W LED can be an energy saver as compared to other traditional lighting systems. A lighting system that consumes 1200w energy can get hot very quickly. The ViparSpectra LED comes with six built-in fans that work to keep the lighting system cool. The fans are attached direct in to the light tray for providing efficient cool to the system. For further cooling, the system also has an aluminum heat sink that dissipates further heat from the system. There are always some cons and drawbacks of products. 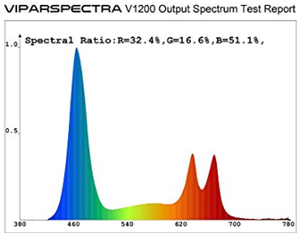 There are also some minor concerns related to ViparSpectra LED. Some customers have complaint that the rear of the lighting system gets quite hot. The fact is that lighting system will get a bit hot as we are using Led lights and also 1200w energy. So, it will become a bit hot and it is unavoidable. Some customers also complained that the lighting system has the inconsistent wattage. According to the manufacturer it is a 1200W lighting systems but customers complains that it only pumps out 900W which is also not bad. But if this is the issue then it has to be resolved for betterment of the product.